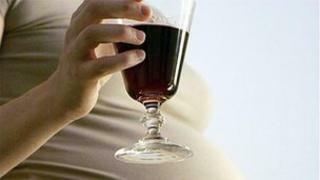 Drinking a low or moderate level of alcohol in early pregnancy is not linked to developmental problems in five-year-olds, researchers say. In Denmark a standard drink has 12g of alcohol, compared with the UK's 7.9g. UK pregnant women are advised not to drink, but experts say those who do should have no more than one or two units, once or twice a week. The scientists looked at the effects of alcohol on IQ, attention span, executive functions such as planning, organisation, and self-control in the five-year-olds. They found low to moderate weekly drinking in early pregnancy had no significant effect on neurodevelopment of children at the age of five - and neither did binge drinking. The lead authors of the work, Ulrik Schiøler Kesmodel of Aarhus University and Prof Erik Lykke Mortensen of the University of Copenhagen, said: "High prenatal exposure to alcohol has consistently been associated with adverse effects on neurodevelopment. "Areas such as intelligence, attention and executive functions have been found to be particularly vulnerable. "Our findings show that low to moderate drinking is not associated with adverse effects on the children aged five." This was because it asked women about their alcohol intake at the time - rather than asking them to look back as past studies have done - and because it followed children for such a ling time and assessed such a range of developmental markers, he said. The RCOG advises that women abstain from alcohol while pregnant, but if they do decide to drink evidence suggests "one or two units, once or twice a week, is acceptable after 12 weeks of pregnancy". Dr O'Brien said: "These findings suggest low to moderate drinking has no significant effect on children aged five. However, this does not mean that women can use this as an excuse to indulge in more than the recommended amount in the UK. "This evidence suggests that the UK guidance is erring on the side of caution - but that's sensible in pregnancy." A spokeswoman for the Department of Health echoed the RCOG advice, but said it would always "take note" of new evidence.